Xara Xtreme is the latest version of Xara X. We have built on the product's acknowledged strengths, its speed and intuitive user interface, as well as incorporating suggestions from our user base. 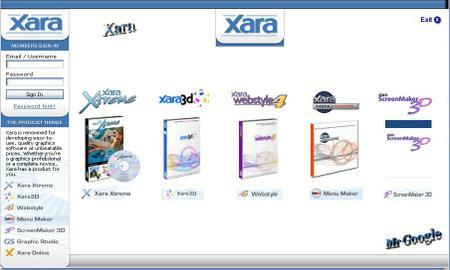 Both professional web designers and home users choose Xara3D to make still and animated 3D text and graphics, such as logos, titles, headings and buttons. Whether you're a time-pressed designer or a complete novice, you can create professional-quality graphics and photos for the web with just the click of a button. Unlike other template or clipart products, Webstyle’s professionally designed templates are totally customizable, without any loss of quality – giving you almost limitless possibilities. Graphic types range from button bars and banner ads to photo albums and complete page layouts. Click on any of the graphic types below to learn more. Create professional, high-quality NavBars & DHTML menus at the click of a button. Xara Menu Maker takes the mystery out of dynamic hierarchical menus and lets literally anyone create cool and clever DHTML menus with classic graphical NavBars. A 3D screensaver maker that's fast, fun and easy to use. Create animated 3D text message screensavers with your own personalized message. Or put any images of your choice onto the sides of a 3D, tumbling cubes screensaver - ScreenMaker 3D accepts a wide variety of image formats, even AVI movies. It's the perfect way to share messages or images with friends, family or colleagues - from family photo screensavers to business screensavers with corporate logos.